Cross stitch is big again. There are artists creating patterns from traditional to more contemporary to naughty. No matter what your style is, there is a designer out there that represents you. Each one of these amazing cross stitchers has their own personal style that can range from family friendly to not suitable for work. Below is a small sampling of the most fun and best cross stitch designers on the internet. Are you a fan of the artwork that Mary Blair did for Disney? It is full of color, happiness, and wonderful shapes. If you've ever been on the It's a Small World ride, you have had a sampling of Mary's design skills. Jody Rice of Satsuma Street shows off her love for Mary Blair with the cross stitch patterns. Showcasing different cities and seasons, Satsuma Street's designs are whimsical, fun and happy. As a matter of fact, she proudly uses the phrase, "Cross stitch for Happy People," and you should firmly believe that. You can find her patterns, for a reasonable price, at her Etsy shop. She is putting out new material all the time, including patterns for the holidays. Wee Little Stitches has been around for some time but that doesn't mean that they are old and tired. Just the opposite! They continuously create new pop culture patterns. Their ​pixelated people have caught on like wildfire and there is no end in sight. They can even create a personalized pattern of your family on the Etsy storefront. Their website has free patterns as well as tutorials for creating the perfect stitch. They are constantly refreshing their inventory and patterns to keep up with pop culture. Make sure you check out their blog and social media pages for sales. No one can take an everyday item and make it look so cute like the Tiny Modernist can. Her samplers are adorable. They incorporate a whimsical aspect to them that carries you away into the pattern itself. Her website includes several informative tutorials such as how to finish up your project and she also includes free patterns. Nerdy Little Stitcher knows how to play with words. Her patterns run from silly to a little cheeky, but they are always hysterical. How can you be mad at a naughty saying when there is a cute little face behind it? You can find her on Facebook and her patterns on her Etsy. If you are looking for a bit of sass, Nerdy Little Stitcher also has fun holiday patterns that are not your normal everyday pattern. She makes naughty too cute! If you are looking for a more traditional pattern with a bit of a twist then Primitive Hare has just what you are looking for. Her patterns are rich with history; both non-fiction and fictional. While most primitive patterns can lack detail, hers are rich in color and design. Her website offers free patterns and as well as for purchase. She also has stitch-alongs. There is a Primitive Hare group on Facebook where you will get previews and other up to date information about sales and patterns. Laughter is the best medicine. Just ask The Snarky Art Company. Their cross stitch patterns are humorous, outlandish and full of wisecracks. Be warned that a lot of the patterns are not suitable for work, people who are easily offended, or small children. If snark isn't your thing, they also have pop culture icons, sweet sayings, and holiday patterns. Rebecca at Hugs are Fun is a blast. Her infectious positive attitude and adorable free patterns will have you hooked in no time. Her patterns are full of vibrant colors and fun images. Check out her site on Fridays for Free Pattern Friday. She also creates other crafty projects such as quilt patterns and hexagon artwork. She does it all! UFO Sighting: Unfinished Objects Ahead! 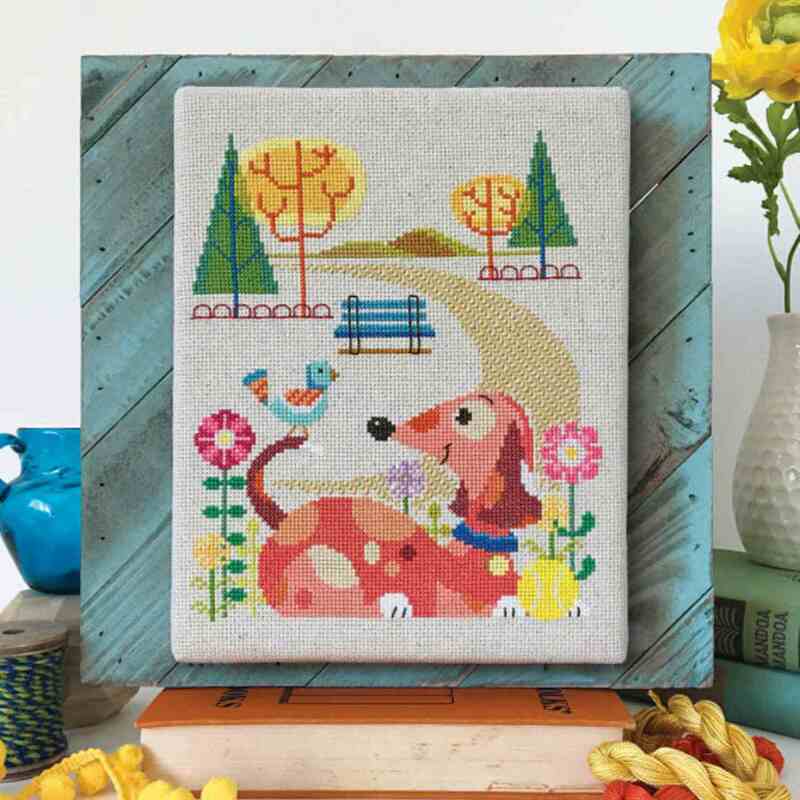 How couching can help your next cross stitch project. What is Fabric Count in Cross-Stitching?